Robert le Dispenser was the main steward - a high status position for a skilled and influential nobleman - for Duke William of Normandy, later William the Conqueror (1066-1087). It is likely the original motte and bailey castle was built c1070. When Robert le Dispenser died without children, the castle and other property passed to his brother’s daughters. Tamworth Castle was inherited by Robert Marmion c1100 through his marriage to Matilda, daughter of Urse of d’Abitot. The Marmions were Lords of Fontenay le Marmion in Normandy. They were the hereditary champions of the dukes of Normandy, and after 1066, the Kings of England. This meant they would have jousted in the Kings colours and offered a ceremonial challenge at coronation ceremonies to anyone who might oppose the new King. For nearly two centuries the Marmion family held Tamworth Castle. From 1100 – 1294 there were six lords, all but the last were named Robert. It is thought this lead to the part destruction of the Sandstone castle keep. Shortly after King John’s death, peace was made between Robert’s sons and the Crown and they regained possession of their lands. Philip Marmion was the last Marmion Lord to reside at Tamworth Castle from 1241 – 1291. He was a powerful, influential nobleman and close supporter of King Henry III (1216 -1272). King Henry is believed to have visited the castle in 1257 this was a great honour and a a symbol of Philip's importance in the kingdom. Philip had no legitimate male heir to inherit his legacy and on his death the castle passed out of the Marmion family forever. For a short period the castle was held by Philip's daughter but on her early demise in 1294 the castle passed to her niece Joan and her husband Alexander Freville. The third lord Freville, again named Baldwin, was a seasoned soldier. He played a part in the Hundred Years War against France and was in high favour with Prince Edward (known as the Black Prince). He was granted the title of Seneschal of Xantoigne (Senseschal - Lord's representative in the administration of an estate, presiding at manorial courts, auditing accounts and conduct inquests). He died overseas. The final Baldwin de Freville of Tamworth died leaving three daughters and one son who was two years old. This son died a minor and the Castle passed to Baldwin’s eldest daughter and her husband Elizabeth and Thomas Ferrers. 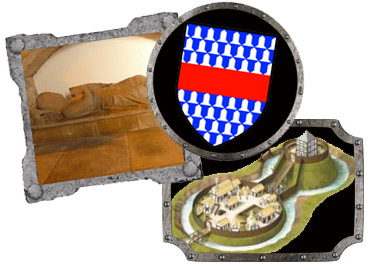 Learn about Tamworth castle flags.